- suitable for all skin types experiencing uneven skin tone. Up to 90% of visible aging is caused by sun exposure. * During the pigmentation process, UV radiation upregulates the secretion of calcitonin gene-related peptide (CGRP). An increase in CGRP causes keratinocyte mediators to stimulate the production of tyrosinase, resulting in excess melanin production. Excess melanin forms a protective barrier against solar cellular and DNA damage, resulting in a dull, uneven complexion and unwanted pigmentation in the form of freckles, spots, and melasma. 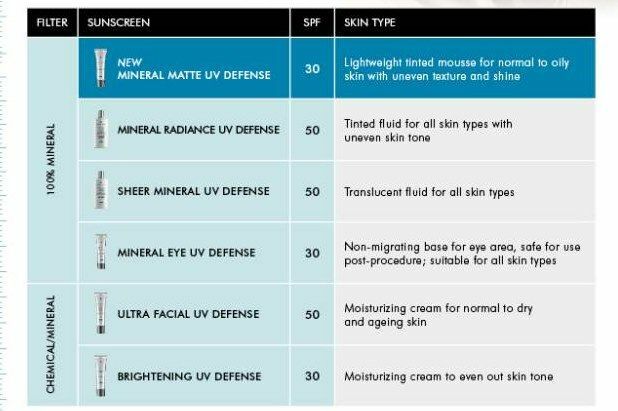 Brightening UV Defense SPF 30 protects skin from the range of UV rays known to cause unwanted pigmentation and accelerated aging. Formulated with HyperBright Complex, a compound targeting hyperpigmentation, this powerful daily-use corrective and protective sunscreen diminishes existing skin discolorations and prevents the occurrence of future pigmentation. State-of-the-art UV filters Mexoryl SX and XL, combined with octinoxate and titanium dioxide, provide broad-spectrum UVA/UVB coverage with minimized chemical filters. Apply daily following antioxidant serum. Reapply frequently and generously to maintain protection, especially after swimming, perspiring, or toweling.